In 2015, the U.S. Women’s National Soccer Team won the World Cup (one of their many World Cup victories) in front of 23 million American TV viewers. No soccer game in American history had ever received such high television ratings. The work of the U.S. Women’s National Soccer team brings massive amounts of revenue to the U.S. Soccer Federation each year—the federation has at times even profited more from the women’s league than the men’s. Yet female players had been earning only 40% of what the league’s men were paid. So, in 2016, the U.S. National Women’s Soccer Team filed an official complaint with the Equal Employment Opportunity Commission, and on March 8th, 2019, the fight continued when the women’s soccer team sued the federation for gender discrimination and back pay. There are many remaining inequalities in the league, one of which revolves around the World Cup Roster Bonus, a sum paid to each athlete selected for the U.S. World Cup team. Women players’ bonuses are $31,250 less than male players’ bonuses, but in a symbolic move announced on Equal Pay Day, LUNA Bar stepped in to close that shocking disparity, donating $31,250 to each of the 23 women on the National Team. In order to help women outside of the league, LUNA Bar has also dedicated a section of their website to relaying information and advice to any woman asking for a raise, speaking to her boss, negotiating her salary, etc. 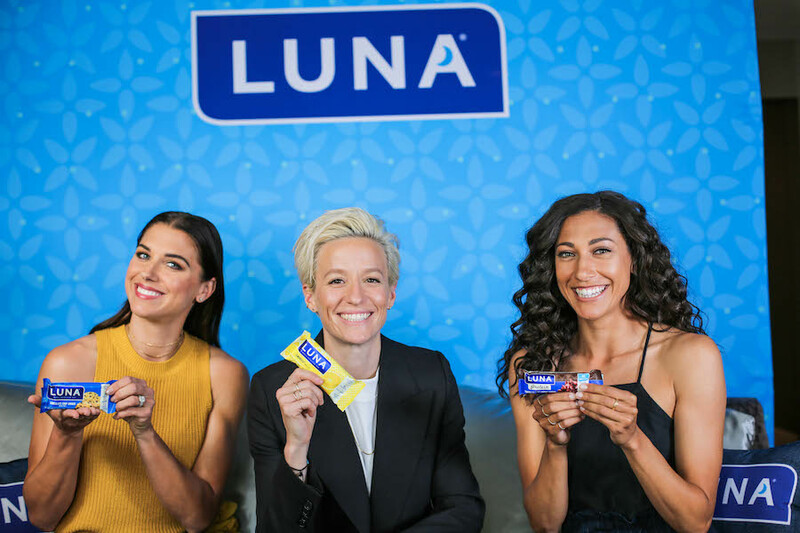 Christen Press of the World Cup team spoke to HelloGiggles about the years-long fight for fair pay from the federation, ways to prepare for negotiations in your own career, and how LUNA Bar’s public financial gift is an important action in the overall movement to close the wage gap in sports. HelloGiggles (HG): Taking that first action to demand equal pay, in any industry, can be very intimidating. Can you describe some of the work that you and your teammates did to organize and prepare before that moment in 2016? 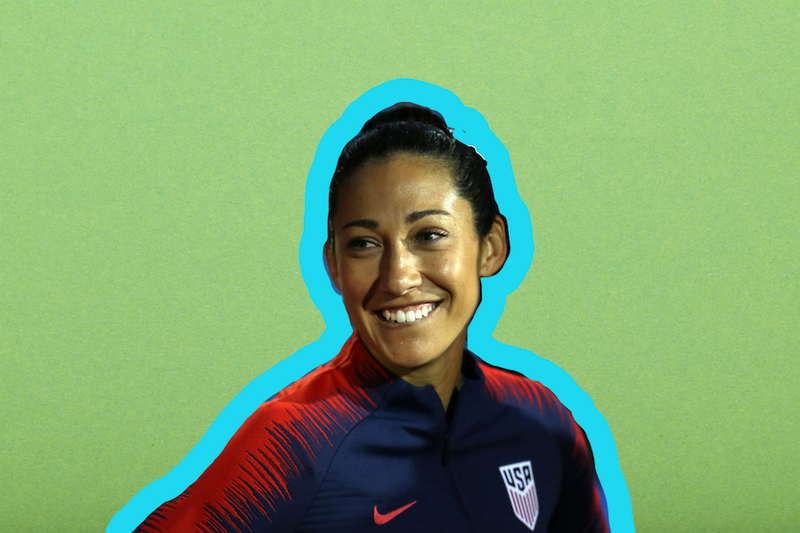 Christen Press (CP): I would say that there is an element of inheriting the fight…of being a part of this movement of female empowerment and to increase the respect of women’s sports. That is something that I think we all learned about the women in the sport before us. They had that torch and took that torch as far as they could. I think they passed it to us, and we take a lot of pride in taking that torch as far as we possibly can in order to make the future better for female athletes and for women everywhere. After 2016, when the discrepancies in payment and treatment on the women’s and men’s sides [of soccer] became more apparent, the first thing that we did was revamp our Player’s Association [the labor organization in the league that advocates for women players]. I think that was such an efficient step in changing everything in our game, honestly…We all started dedicating hours of our time towards making decisions, being informed, and putting our investments into our own Players Association. And what came out of that was a very powerful entity that has the ability to actually enhance our position in the world, and have respect from our employer, and empower and educate all players when they come into this work environment. And so that very much prepared us for this larger fight for equality and equal pay under the law. That had obviously started way before us, but we were just able to take that to the next level by empowering ourselves, empowering our team, and getting the information, education, and support that we needed to take the next big step. HG: Obviously, the fight isn’t over. Can you share some of the actions you’re continuing in order to expose issues like the World Cup Roster Bonus? CP: I feel like, actually, this exact moment is the most active the team has ever been in standing up for equal pay. The lawsuit is the most outward-facing thing, but internally, we’ve dedicated so much time, effort, energy, and mindshare on understanding these issues and making these decisions as a collective group to try to change the dynamic. It’s been amazing to have a partner like LUNA Bar give us the opportunity to enhance this message. And that came with this significant donation, which we were all so excited about and stunned to hear. And we are very excited to announce this to the world because the financial gift becomes more than just the money—it becomes a statement to the world that this company believes in our work and our value and our power. HG: Working in an environment where you feel unsupported or undervalued, and fighting for that value, can lead to burnout. How do you maintain your passion and dedication to your work while also battling unfair compensation? CP: It is a completely unfair position for women to be in to have to do their normal job and then have this additional job on top of it of fighting for their own worth…But for me, personally, I find the work very energizing. I am energized by the idea of fighting for the value of other people as well as for myself. I also have a very good self-care strategy, which includes having boundaries of when I will work and when I won’t work in order to preserve my well of energy. So that way, when I am working, I am doing so enthusiastically and purposefully; I feel like I’m getting a lot from what I’m doing. It’s not a give-give-give, its a give-and-take. In that way, I feel like it is very balanced and energizing. HG: I think a lot of us are conditioned to feel that we should just be grateful for what we are given, which ties into impostor syndrome. Did you and your teammates ever feel that kind of insecurity when you were getting ready to take the fight public? How did you overcome it? CP: That is absolutely something that we deal with. Our roster changes so quickly, so what happens is that younger players coming in for the first time then don’t have the capacity to do this kind of off-field work. As a younger player, you might not have the context to understand why it’s important yet. And also, because of the way women’s soccer is set up, you are probably making a lot more than you were before. You’re either coming from college or another league without financial compensation. And so those things all kind of create this transition where people are very satisfied with how things are…it actually takes a while to see how this pay discrepancy personally affects them. I share with the team that we should be grateful—gratitude is beautiful and amazing—but that shouldn’t work against wanting more for ourselves or for others. I feel like what we’ve done specifically is we have really created this perspective that the work we’re doing is for the future. So if you feel “Oh, we should be grateful; we don’t need to fight for this,” then you can calm that feeling by talking about what you’re making better for the future. If you take that approach, then it becomes so much bigger than yourself—but we should still see our own value as well. Gratitude, self-love, and this movement work together in a very beautiful way, as opposed to working against each other. Collectively as a team, we do shift the narrative to talk about our fight for equality and our bolstering of the Players Association and all the work we’ve done as going toward the future. And the discrepancies in the global game of women’s soccer are just massive. There is no thought of “Oh, this is good enough.” So we fight harder and we fight together. HG: Was there any aspect of negotiating that you didn’t expect that you’d be better prepared for now? CP: It was my first negotiation, so almost everything was new. But the more confident I got, the more I understood that I was part of this [movement]. I started off worrying about every word that I said, not wanting to speak spontaneously, and having everything prepared. But as I became closer and closer to the information and to the facts, and I started understanding our own arguments and counterarguments, I think that my confidence grew. I was much more capable of speaking in a way that I thought was very valuable. If negotiations or that potential conversation feel scary, just like everything else, it’s all in how you approach it. If you don’t see it as scary but as an opportunity to speak your own truth and show your own value, then it’s a very uplifting thing. Think of speaking to your boss or asking for a raise as an important piece of your overall life, celebrating your worth, and having success in your career. I think that puts you in a position to see it more favorably and be more intentional about the process. HG: For women who don’t have your same platform and are demanding equal pay, do you have words of advice or support? CP: We sometimes look at social movements as top-down work, but in the end, it’s the bottom-up work that creates real change. And that is true in your own life. That means sharing what you know and what you’ve learned with family, friends, and co-workers. That means looking at your daily decisions, and being intentional in the products that you buy and aligning yourself with the right companies. That’s taking steps like marching or expressing yourself by writing or whatever action you want to take. Small daily intentions and small daily decisions really change the world, so feel empowered by yourself…Feel empowered in the little decisions you can make each day to be a better person, and how those decisions can inspire and uplift others.